William Benjamin Duncan (Jr.) (named for his grandfather) was born on January 6, 1893, in the town of Beaufort in Carteret County, N.C., to Edward Carl and Carrie King Duncan. Carrie Duncan died by 1900, leaving Edward Duncan to raise four young children on his own. Edward Duncan was appointed the Collector of Customs of the Port of Beaufort, N.C., in 1890, in which position he served until 1894. He was elected to the North Carolina legislature for 1895 and 1897 sessions. In 1898, Edward Duncan was appointed the Collector of Internal Revenue in Raleigh, N.C.
On November 11, 1903, Edward Duncan married Alma C. Speight in Wayne County, N.C., and the new Duncan family would come to live on East Lane Street in downtown Raleigh, N.C., by 1910. In 1908, Duncan resigned from Collector of Internal Revenue to become one of the Receivers for the Seaboard Air Line Railway. In 1908, he was picked as one of five men for a subcommittee which managed the 1908 presidential campaign of William Howard Taft. A strong Republican political figure in Raleigh, Edward Duncan was a member of the North Carolina Republican Convention that hotly debated their support of William Howard Taft for Republican Presidential candidate in 1912, or accept overtures from Teddy Roosevelt’s Bull Moose Party. Duncan was the Republican National Committeeman from North Carolina for the 1920 Republican National Convention in Chicago. In total, Edward Duncan was a Republican delegate from North Carolina to the Republican National Conventions in 1896, 1900, 1904, 1912, 1916, and 1920. Edward Duncan would become a director for the Norfolk Southern Railroad Company. He also was a director for the Commercial National Bank in Raleigh at the time of his death. William B. Duncan attended college at Trinity College (part of present-day Duke University) in Durham, N.C., where he studied law. Duncan was attending the school from 1911 through 1914. In the summer of 1911, William Duncan was chosen for a summer position with the U.S. Bureau of Fisheries’ biological laboratory in Beaufort, N.C. Duncan suffered from appendicitis in July 1912, and had emergency surgery in New Bern, N.C., from which he recovered. 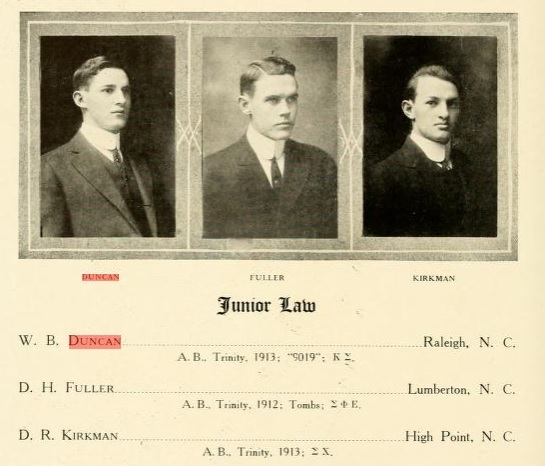 Duncan began practicing law in 1915 with fellow Trinity College Law School graduate Willis Smith, as the two men setup practice in Raleigh. By the time of his draft registration for World War I, William Duncan was living and working in Raleigh as an attorney as a member of the firm Smith & Duncan, with their offices based in the Citizens National Bank Building in the city. After the United States entered World War I in April 1917, William B. Duncan enlisted in the North Carolina National Guard on July 24, 1917, in Raleigh, N.C. He would be initially assigned to the National Guard’s Signal Corps. Duncan was transferred as a Private to Company H, 113th Infantry. Duncan was honorably discharged on November 27, 1917, in order to accept an officer’s commission as a 2nd Lieutenant in the U.S. Army with a field artillery unit on November 28, 1917. Duncan was assigned to the 113th Field Artillery, 30th Division, U.S. Army, in which unit he would remain through the end of his military service. Duncan was assigned with his unit at Camp Sevier, S.C. He was promoted to the rank of 1st Lieutenant on December 26, 1917. Duncan and his unit left the United States on a troop transport ship for overseas service in Europe on May 27, 1918. He was involved in the Meuse-Argonne Offensive in the fall of 1918. After the Armistice in November 1918, Duncan’s unit was assigned to occupation duty in Europe, specifically in the small country of Luxembourg. 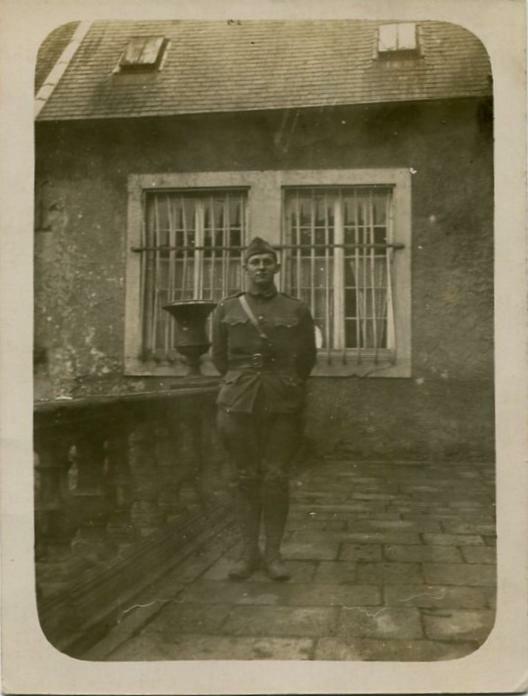 On December 13, 1918, Duncan’s unit arrived in the town of Reckange, Luxembourg. By December 29, 1918, Duncan was stationed in Colmar-Usines, Luxembourg. William Duncan left from France and arrived in the United States on March 18, 1919, at Newport News, Virginia. He disembarked and was sent to Camp Stuart in Newport News, from which he and his unit were sent to Camp Jackson, S.C. William Duncan was honorably discharged from active military service at Camp Jackson on March 28, 1919. By 1920, Duncan had returned to his family’s Raleigh home, and had begun working as a lawyer in a general practice. His father Edward Duncan died on August 29, 1920, in Beaufort, N.C., leaving William as executor of his will and estate. In 1921, William Duncan was one of two main candidates to be nominated in October 1921 by newly-elected President Warren G. Harding as the Collector of Internal Revenue for North Carolina; but, he lost out on the position to Gilliam Grissom of Greensboro, N.C., then secretary of the North Carolina Republican Committee. In lieu of this position, President Harding was reported to be ready to appoint William Duncan as the North Carolina representative for the U.S. Veterans Bureau. He declined this position, intending to fight for the Collector of Internal Revenue position—a position which his father had held in Raleigh for a number of years. In order to take care of the son of a long-time important Republican supporter of President Harding, it was rumored in October 1921 that North Carolina would be divided into two regional revenue collecting areas, for which Duncan would be appointed to the Eastern District. By 1922, William Duncan was serving as the acting postmaster for Raleigh, N.C. According to the 1922 Congressional Record, Duncan was approved as postmaster for Raleigh by August 1922. William Duncan married Margaret Dale Calvert in Raleigh, N.C., on June 9, 1923. Duncan continued working as both a lawyer and postmaster in Raleigh through the 1930s, and was a lawyer for the remainder of his life. William B. Duncan died on October 31, 1953, in Raleigh, N.C., and was buried in Oakwood Cemetery in the same city. To learn more about William Duncan's military service, check out the William B. Duncan Papers (WWI 114) in the WWI Papers of the Military Collection at the State Archives of North Carolina in Raleigh, N.C., and explore the attached collection finding aid for the extent of his materials.